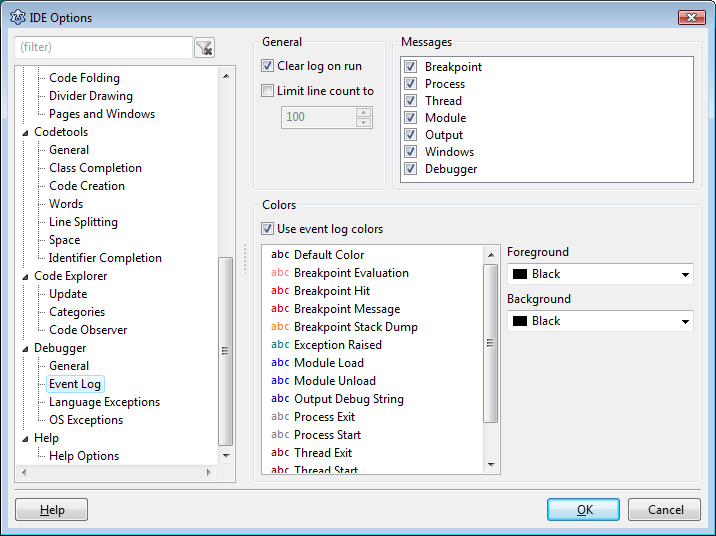 This article describes the settings in the Tools/Options menu related to debugging. No debugger. On Run, simply execute the program. GDB is not a part of Lazarus. Unless you are using Windows or Mac OS X with Xcode, you must install it yourself. This is the connector to gdb. You must set the path to gdb (for example /usr/bin/gdb) in the field below. You can add extra directories, where to search for sources, named in the debugging information of the executable. This is used for all projects. Enable this to show a notification, when programs stops. The IDE keeps GDB running and re-uses it. If you are using a (older) version of GDB that does not support this, then you can start a new GDB instance each time you start a debug session. Each debugger type has special options. Experimental. Those option affect the quoting of certain path/filenames when they are given to GDB. Changing the option to the wrong value will stop the debugger from working. 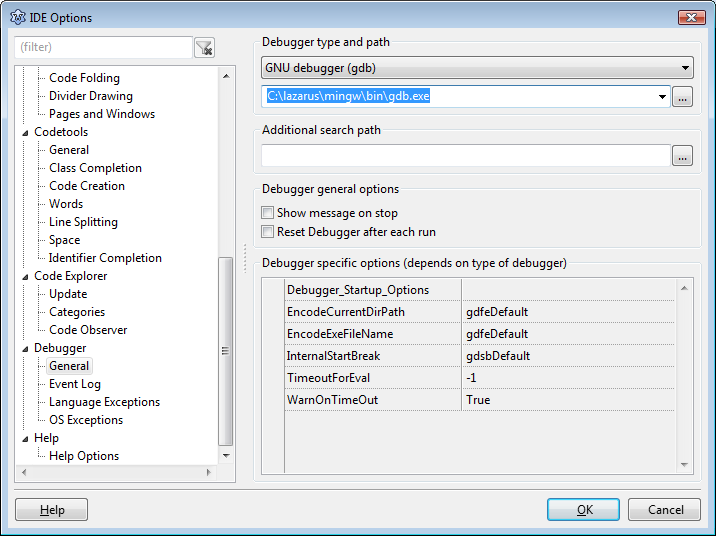 Changes the way the debugger detects your applications, main entry point. It is advised to leave this at default. Other values may be tried, if the debugger report an error "The debugger could not set a breakpoint on the applications entry point". For any string (pchar) gdb reads a maximum as specified by this setting. GDB always terminates at the 1st zero. GDB does not really handle pascal strings well. Mainly supported by gdbserver. Setting should be used for any remote debugging (gdbserver/gdb over ssh). See gdb documentation for "set target async". IF supported by gdb, can also be used for local debugging. Eventually logging info should go the the event log, for now it is show in the debug output window. Clear log on run: clear the event log, on each start of the program. Limit line count to: keep only the last lines of output. 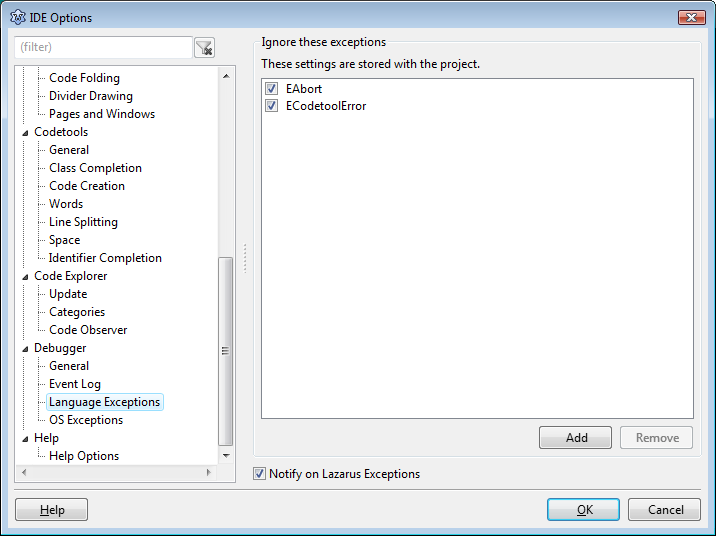 The Messages window is usually positioned below the source editor and shown, when building the project. It shows the compiler output and can show the output of external tools. Programs can raise exceptions. For example, when a file can not be read. Here you setup, if the debugger should stop on an exception. 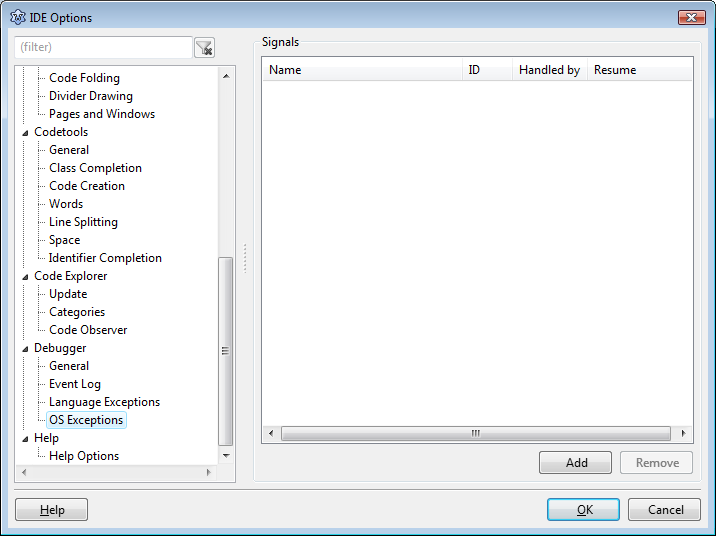 Defines if signals should be handled by the debugger or by the user program. For instance, an div by zero is first signalled by the OS. Then the FPC RTL translates this to an EDivByZero. When the signal is handled by the debugger, the program is stopped before the RTL translates this message. Currently the debugger always stops on a signal. This page was last modified on 25 November 2015, at 13:01.